In our previous guide we showed you how to play Bonus Pai Gow Poker. 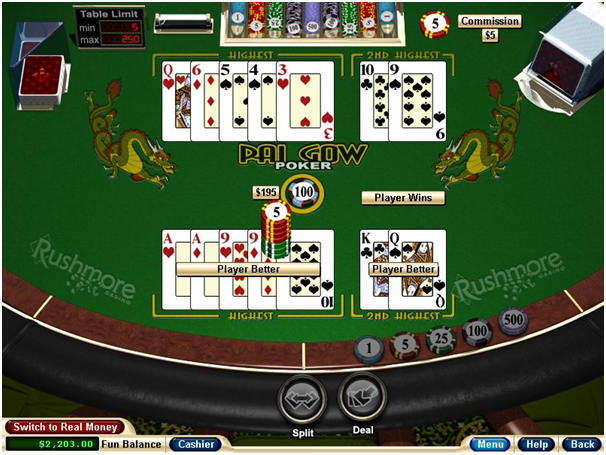 In this guide we will show you as how to win the bonus Pai Gow Poker Game. As you know are familiar with this poker variation game there you have to divide your hand into two smaller hands and try to beat the dealer’s two hands. There is also a bonus bet determined by the strength of your original undivided poker hand so here find as how to win the Bonus Pai Gow Poker and know a bit more about Bonus bet. First thing to win this poker variation game is to know the game thorougly . You should know the game rules and then start playing. You can also take advantage of the free online Bonus Pai Gow Poker games available at online casinos to know the betting scenarios and the odds of the game. Put beside the money you wish to stake. Before you place your first Bonus Pai Gow Poker bet, decide how much you’re willing to risk and don’t increase that amount no matter what. Don’t get swept away is you win or become desperate if you lose. Don’t get swayed away by emotions but play wisely and keep track of your winnings, too. You need to pay attention to both Pai Gow poker hands. As you start playing you should remember not to neglect the low hand. It is tempting to put all your good eggs in one basket and to build up the high hand, but that’s not the way to go. Don’t forget either hand and thus take your time to find a way to build two hands that both have good chances of winning. If you have a full house, break it up and put the pair in your low hand. Each combination of dealt cards (full house, 3 of a kind, 2 pairs, etc.) has a place all its own in the Pai Gow Poker basic strategy. With a combination of common sense and the accepted Pai Gow Poker strategy, the moves for these combinations will become second nature. The point is, though, that common sense is an important asset to bring to the table. Don’t underestimate the power of your own wisdom. If in the pressure of the moment, the basic strategy eludes you, just think for a few seconds always remembering the basic rules of the game and the most logical move will probably come to mind. Once you know the game and it starts making sense to you, you can trust yourself to master and win Bonus Pai Gow Poker. Remember the “Bonus” in Bonus Pai Gow Poker as Bonus Pai Gow Poker is actually two online poker games in one. The first is the high-hand-low-hand game. The second game involves a bonus bet. Many players forget about the bonus bet, When you win Pai Gow Poker with a regular bet, you win even money minus the 5 percent house commission. So if, for example, you bet $10, and your high hand and low hand beat both of the dealer’s hands, you win $9.50 in addition to your original $10. Of course, winning is winning; you won’t complain about almost doubling your money. But if you want to do better than that, you will find that the big real money jackpots are in the bonus game. 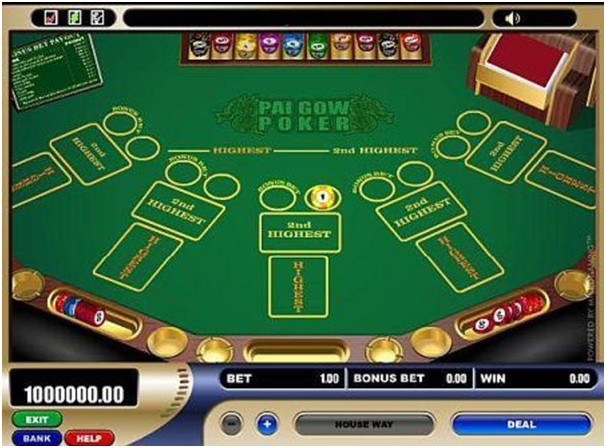 When you play Bonus Pai Gow Poker online, your bonus bet is independent of your regular Pai Gow Poker bet; it can be a bet of the same amount or higher or lower. In the bonus game, your seven cards are looked upon as a single seven-card poker hand. Most importantly, your bonus game is not played against the dealer. You win or lose your bonus bet based on an objective measure of the quality of your poker hand. If you have a five-card straight, you get a payout of 2-to-1 on your bonus bet (with no commission taken out), regardless of what the dealer has. Three-of-a-kind pays out 3-to-1; a five-card flush pays 4-to-1. The payouts keep getting higher and higher for a full house, four-of-a-kind, a straight flush, all the way up to a phenomenal 8,000-to-1 payout for a seven-card straight flush. That means that, with a modest $2 bonus bet and a seven-card straight flush, you could have an extra $16,000 in your bank account. You certainly do not want to overlook the potential real-money jackpots you can win at Bonus Pai Gow Poker with the Bonus bet. Bonus Pai Gow Poker game players have to create two different poker hands against the dealer and the game is played against the house, not against other players. The highlight of this variant is a bonus feature, which can be triggered by placing a bonus bet, the size of which depends on the overall strength of the seven cards originally dealt to the player. Playing Bonus Pai Gow Poker is a great game and players who follow a few strategies can definitely increase their odds of winning. Players must make sure that the value of their two-card hand is lower than the value of their five-card hand. For instance, they must avoid placing a pair in their two-card hand unless their five-card hand has something better than a pair. If players’ original seven-card hand comprises two pairs, the pair of lower value must be placed in their two-card hand. However, a lot depends on the value of the other cards in their hand. Players will definitely win if they have a flush or a straight, owing to which they must place these combinations in their five-card hand and leave the rest for the two-card hand. An interesting strategy is to place their best card in their five-card hand and the second and third best hands in their two-card hand. It is unique owing to the presence of attractive bonuses and the Joker. The function of the Joker in this game is unlike any other game of poker. As said above the Joker cannot be used as a wild but players can use it to create a Flush, a Straight, a Straight Flush, or a Royal Flush. In all other combinations, the Joker assumes the value and function of the Ace. The strongest hand in this game is a Joker with four Aces, followed by the Royal Flush and the Straight Flush. The next hands include 4 of a Kind, the Full House and the ordinary Flush, which is followed by a Straight, 3 of a Kind, 2 Pairs and finally a single Pair. The “Bonus” Pai Gow Poker game has an optional feature of Bonus Bet for bigger payouts. The Bonus Bet is not played against the dealer. It is individually trying to get a winning poker hand. The second important thing is that it is your entire seven-card hand that counts. There is no split into Highest hand and 2nd Highest hand, as far as the bonus bet is concerned. The bonus bet pays 2-to-1 for a five-card straight, 3-to-1 for three of a kind, and even more for better poker hands such as a flush or a full house. The best payout is 8,000-to-1 for a seven-card straight flush. One important thing to remember before forming a strategy to win is that in this game as said above is that the player and the banker must have two hands. When a player who has a small hand that beats the large hand – it will be declared a foul, and the ante bet will be lost. According to the Wizard of Odds the first important thing is to remember while playing this poker variant is that the you will need to place the ante bet before any of the cards are dealt. This bet is to ensure that the dealer understands that you are in the game. Once this is done, the dealer rolls a dice to determine which hand will be dealt to the player. Each player is pitted individually against the dealer which makes the competition very interesting. After receiving the player’s seven cards, the player then decides on the split in the hand, between the small and the large hand. While doing this, it is important to remember the rule of thumb where the small hand is always smaller than the large hand. Another point for online poker players is that there is an additional wager amount that the players will have to place. This additional amount is based on the hand that the dealer holds. The dealer will be the first to turn over his/her hand, and then the player follows suit by showing the small hand. In case the player’s small hand is better than that of the dealer, then the player wins the game, otherwise the dealer wins. Finally, the player and the dealer compare their large hands and the higher hand wins. Finally to remember is that the player must win both of the two hands. There is a fixed payout table that illustrates the payout for various hands held. 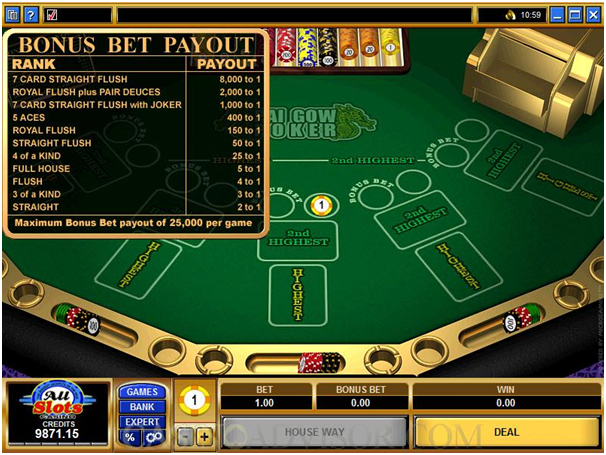 The payout that the player receives is based on this table and the hand that was created by the player.